This event took place in Shizuoka, town twined with the French city of Cannes. This festival was organized by the French-Japan association and his president Kei Shionoya (Grand Prix de l'Académie Française for foreign writers*). 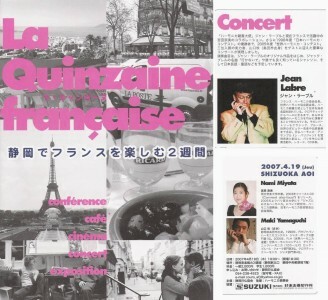 A fortnight dedicated to musical and cultural rendez-vous around cinema, painting, with meetings and conferences, and a special honor guest : the mouth organ, officially presented, on April the 19th, in an opening concert in the Shizuoka AOI hall with Nami Miyata, Maki Yamaguchi and Jean Labre. This event has also been celebrated, on April the 16th, in Tokyo, by the "Japon Radieux" concert. With, at the program, the girls harmonica trio " Comment allez-vous ? ", Nami Miyata, Reina Obe, and Aya Kuroda with the French pianist Yves Pelras. 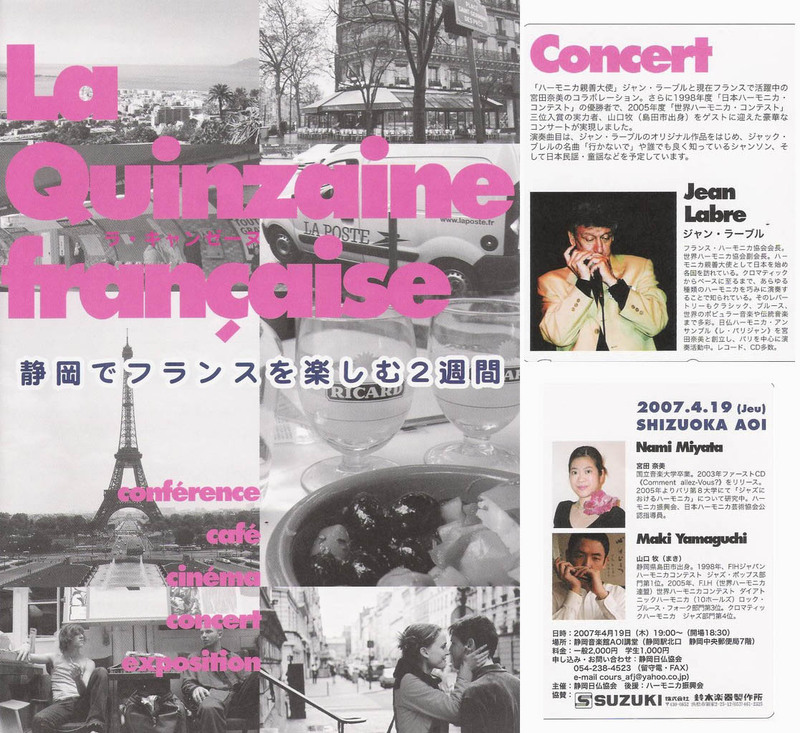 This concert has been followed on the 24th, by an evening with the "Amateurs de la Musique Friendship Club" where the jazz singer Satsuki Itho and Jean Labre will perform. Due to a calendar coincidence, the AJHF convention (All Japan Harmonica Federation) took place the last week of April in the Juraku hotel. Beginning with a concert on the opening night, the 28th, with the virtuoso Yasuo Watani, Akemi Iwama and Yuko Yanagawa performing in the Ino concert hall. The annual general meeting followed on the Sunday, brought to a close by a dinner concert with Jean Labre, guest of this convention. * Prix Roland de Jouvenel for his book « Cyrano et les samouraï ».